Predominantly seen along highly trafficked roadways and intersections, bandit signs effectively relay your business services to consumers. More importantly, bandit signs, when designed properly, dramatically increase customer leads. Ultimately, these signs direct customers to you! As a cost-effective way to get your business noticed by consumers, bandit signs work on the principle of frequency. These guerilla marketing style signs continually imprint your message, services and company name into the consumer�s mind. And, since band it signs are placed along busy roadways and intersections, they reach a broad and captured audience who are exposed to your services whether they like it or not. 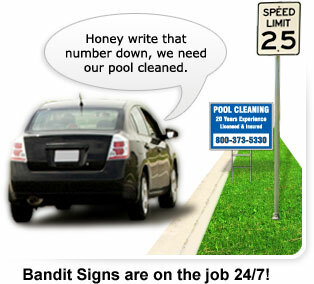 Used by political parties, builders, realtors, real estate investors, cleaning companies, pool services, lawn care professionals and many other businesses, bandit signs are the ideal marketing tool for small businesses. These weather resistant outdoor advertisements are a proven method for successfully increasing your company�s market share. For a small investment and some minor effort, you can utilize a bandit sign campaign to direct customers to you without draining your budget. These mini-billboards relay your company�s message 24 hours a day to a vast customer base. Bandit signs are the best and most aggressive marketing tool for small businesses. You get maximum market exposure without bankrupting your budget. Bandit signs generate new leads for weeks. The beauty of bandit signs is their cheap production cost, they�re free to post and they reach a vast audience. Sure, creating the bandit sign was easy enough but where do you put it to generate the most leads for your dollar? When utilizing bandit signs as part of your company�s marketing campaign, saturate the targeted area with 20 to 25 signs. You want people to notice your signs without feeling overwhelmed by too many. Typically, the signs are placed 10 to 20 feet off the road and approximately a quarter mile apart in both directions when along stretches of roadways. In neighborhoods, only place bandit signs where complete stops are required, especially if using a sign smaller than 18x24 inches. How do you know when bandit signs are right for your company? Does your company need to relay a message to customers such as new services or pricing? Then it�s time to bandit. Want to expand your share of the market? Then start using bandit signs. Anytime your company needs to relay information such as pricing, services or product promotions to existing customers or future customers, bandit signs are the right means of advertising for your company. While there are a few different size bandit signs, the size that generates the most new customer volume is an 18 by 24 inch size bandit sign. When it comes to bandit signs, not all sizes are created equal. By all means, they all relay your message accurately; but, only one size has the advantage of being seen from long distances while driving 30 to 50mph. As the easiest sign size to read, 18x24 inch bandit signs characteristically produce more leads than any other bandit sign size. Make it easy for potential customers to identify your company by utilizing the correct bandit sign size. Do not get �business card syndrome� with bandit sign messages. Keep the bandit sign blunt and to the point. There is no need to add extraneous information. All it does is clutter the sign and make it more difficult for the customer to retain important information like the company�s phone number. Only put information that can be read easily when driving 45mph on the sign. Most consumers only have 3 to 5 seconds to read and remember the sign so the general rule of thumb is to keep the message as clear and short as possible. Most important aspect of a bandit sign is the phone number so make it pop. Phone numbers are strongly recommended as consumers will write the number down whereas they tend to try and memorize website addresses. Make sure the phone number is the most prominent aspect of the sign. Voicemails are a great marketing tracking device. Assigning a specialized number through a voicemail service such as Ringcentral.com allows you to track how effective your bandit signs are at directing customers to your business. Tell what you do, not who you are. Customers contact your business because you offer a service they need so make sure to clearly display services on bandit signs instead of general company information. At 45mph, consumers have approximately 3 to 5 seconds to notice and read your sign amidst environmental and advertising distractions so bandit sign advertisements must be clear and concise. A blue and white color scheme achieves the most results. While other bright colors will get noticed, research has shown that a blue and white color scheme will draw far more attention than other color combinations.